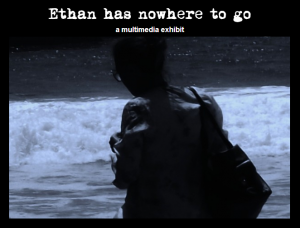 Today I spoke with Jeremy Hight, the “curator” of a project called Ethan Has Nowhere To Go. What started as a short story became a multimedia online interactive experience once Hight killed the author by removing himself from the project, and handed over the creative reins to a number of artists. You can check out the project at Unlikely Stories. Alexandra Naughton: Please tell me about your project. Jeremy Hight: I wrote a 12 page short story called “Ethan Has Nowhere To Go.” Did a dozen drafts, had a writer’s group workshopping. The whole deal. Then it hit me when it was about be published– invert it. AN: Where did the idea come from? JH: My MFA thesis in the writing program at Cal Arts was actually a “painting” made from a film I shot with a prose poem inside that ran on spools as a loop with a motor from radio shack I put together. It had a hinged frame (more like a window) that forced the viewer to interact. Wherever the prose poem stopped (incompletely in the blank spaces in clouds) was to the next person “finished.” Roland Barthes’ death of the author: the viewer is the ultimate author as they agitate into being the triggers in text or image or both. It hit me to finish that idea. Push it. The story must be its iterations. Removing me completely but for a trigger for those asked to participate. AN: What is exciting about killing the author? H: The first one back in the day was the idea that any creative work is a collaboration with whoever reads or views. The space between almost hangs astronautically in the air. The poem or film or whatever it is triggers and form from one person that another meets with their mood, aesthetic interests, interpretation, etc… interactivity really. This time it was a bit different. The year I spent on the prose was now a tiny patch of code, something on the back end. It also allowed it be playing with net and non net text and dialects and take down the line between computer science, art, poetry, and all things between. I did that before when I curated online for M.I.T but it was a show erasing lines not a creative work. I realized when the works came in that it also was a kind of cloud as a work and curating as art and writing in a way I had not thought of. The music video by Aaron Avila and Lauren Henny that eats itself and burps up shards of the text is two iterations away actually. Henny wrote a song from reading the story which Avila cut-up to made a music video from his ideas that fired from her song and the story. There is a palpable tragedy that was a key but intangible elements of the story I first wrote. That first “Ethan” tried to outrun his ego but thought it was to leave the childish part of him behind; he essentially ran away from home for a whole lifetime thinking it was living. The video has that and a whole new tension of form and deconstruction and her song’s narrative. Amazing stuff. The first video game is the whole story made into levels and visual symbolism. He is a computer science phd working on converting classic literature into functional games with music by a composer he brought in. The work is all Ethan and it is a “living” work. More works will come in the next few years. AN: How did you choose the artists who reinterpreted the work? JH: I put out a small call actually and solicited a few people with a range of skills. I wanted it to not be too huge or small. Ten or so is just right.The e lit works and poems beside art games is a nice mix and range and all are the story now and forever. I tried to keep the call a bit ephemeral also (gently worded, not true curatorial speak and super short). AN: Trying to think of another smart question to ask you… how much editing went into the project on your part? Does death of the author mean you completely let the reinterpreters do their thing? JH: It took me a year to finish the short story and stop actually two magazines that were going to publish it. Then I took a month to figure out and brainstorm the project and how it would work. At first I was going to have the word doc of the story hidden somewhere on the show page. That soon seemed to be watering down the core concept so I abandoned it. I needed to fully commit to removing myself. The works had free reign. It was amazing to see them as they began to come in. Each person took it to a new place and their place and the level of writing and creativity was beyond even what I had imagined. I then just added a photo I shot and a short text on the final show page to give context of what it all was/is. The aesthetics of the layout is super simple to keep it to just the works and nothing else. Oh! the cool thing I had not thought of was the story title having two reads. In the short story a guy wastes his life trying to outrun his childhood and teen self and their immaturity and pains and instead comes home with a life open as sores/failures not the suturing shut of closure he longed for (hence nowhere to go). With the show the title can also read as the limitation of the traditional publishing and the story breaching it to these new people and iterations even as it was left behind. Ethan has nowhere to go so he becomes other works… and then is Ethan again, iterations of Ethan, many forms and still Ethan. I like that happy accident a lot. AN: I like that a lot, too. What else do you want to say about the project? JH: I think that pretty much covers it. It has been a joy to see the works together. It will be interesting to see the ones that will be ethans in the future and even ethans from the ethans. AN: An ethan inside of an ethan inside of an ethan inside of an ethan. AN: An Inception of ethans. JH: Yes. The kaleidoscope of ethans and so forth.